In general, gang-related crimes fall within the jurisdiction of state and local law enforcement. As gangs have spread across the country, and as their threat has become more national in nature, the interest in finding solutions to the problem has increasingly included all levels of government. In 2006, the first joint gang unit for Spokane County was created in response to an increase in gang related violent crime. In 2008, the unit was recognized as an FBI Safe Streets Task Force. The Spokane Regional Safe Streets Task Force is made up of street officers, investigators, and support staff, all of whom were dedicated to eliminating or drastically reducing the gang problem. It collects and reports information on all types of gangs and does not focus on any individual or gang solely because of ethnic or socioeconomic status. The Team has been a model emulated by new task forces both in Washington State and throughout the nation. Members of the unit are called upon often to assist in the formation of new task forces based on best-practice models. As part of a grant from the Bureau of Justice Assistance, in 2010, GSSAC and the Spokane County Sheriff's Office collaborated with all of our regional partners to complete the first Spokane Gang Assessment. This was the first formal gang assessment of any region within Washington State. In response to increased gang activity, the SVCGET and the Greater Spokane Substance Abuse Council has created this website to keep Spokane a safe place to live and work. The website allows residents to report anonymous tips and suspicious criminal gang activities in an effort to thwart the threat. 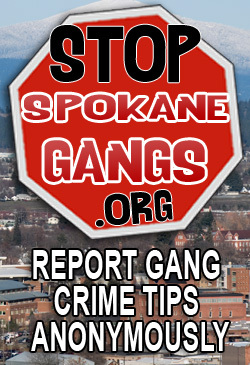 Our Objective - To disrupt and dismantle the most significant and violent gangs in Spokane and surrounding area.